Microsoft released the following three updates for Media Center over the last couple of weeks. The first two updates fix an issue where in certain scenarios, an Emergency Alert System (EAS) message does not automatically tune to the appropriate channel. These two updates also replace all previously released cumulative updates that have been released for Media Center for Windows Vista and Media Center TV Pack for Windows Vista. The third update improves the Windows 7 Media Center experience when you are using an ISDB tuner. ISDB is a Japanese standard for digital television and for digital radio. Peter Near, former Microsoft MVP for Media Center, has been passionately blogging about getting OTA ATSC reception to work for Canadians in Media Center. Throughout the Windows 7 beta, he has made blog postings, which I allude to in the blog postings 'ATSC workaround for Canadians for Windows 7/Media Center TV Pack for Vista ', 'ATSC in Canada for Windows 7 and WMC TV Pack', and 'ATSC vs Windows 7 Media Center/TV Pack for Windows Vista walkthrough'. Thanks for the informative posts, especially with the screenshots. I'm sure many will appreciate this. As some of you know, one of the things that I'm passionate about is youth engagement. Through the Maytree Foundation's DiverseCity onBoard initiative, I was fortunate to have been asked to serve on the Board of Directors for Ontario Nature. At the 78th Annual General Meeting a few weeks ago, I was asked to present the Youth Writing Awards for 2008-2009. Having this opportunity to present, I made some remarks on the importance of youth engagement for Ontario Nature, which I feel can be applicable for other organizations. It is my honour and pleasure to be able to present the winners of Ontario Nature’s 4th Annual Youth Writing Contest. When I was first approached to sit on the Board, I was immediately drawn toward the many Ontario Nature programs that incorporated youth involvement, such as the Youth Writing Contest, Youth Nature Camps and Volunteer for Nature programs that emphasized family-type programming. In the last year, Ontario Nature, in conjunction with its many partners, has further expanded its youth programming through initiatives such as “From the Ground Up” and “Youth Leadership”. I think these initiatives to increase youth involvement have yielded great results so far, and if anyone has any ideas to increase what we can do to involve youths in helping to conserve nature in this province, feel free to share these ideas with Ontario Nature staff, or Board members that are in attendance today. I would also encourage everyone here to take time to engage youth members at upcoming events. Start a conversation, share your own experiences and learn about theirs. Who knows, you might just provide that spark that opens the door to a life-long nature experience. The essay winners were chosen by a selection committee consisting of Stephanie Foster, former Ontario Nature Board Member, David Robinson, Mountain Equipment Co-op and Clare Mitchell, Ontario Nature staff member. There were over 170 entries from across the province and it was difficult to choose amongst the essays. We thank everyone who made a submission, and we encourage each and every one of them to stay involved. In the end, five essays were chosen to be honoured. The winning essays will be printed in the fall issue of ON Nature, posted on the Ontario Nature website and sent to the Premier. It is my hope that all organizations (and their members within it) take the time to evaluate how they can involve youth in the activities that they deliver where applicable. Get youth involved early and let them show off their new ideas and perspectives. I can't understate how this is such an empowering feeling which will further their level of engagement. I can speak from personal experience on this front. It may be difficult at first to determine the best way forward, but the rewards can be so great, both for the organization and most of all, the youth. A few months ago, you may have remembered the EcoSuave 2009 event that I blogged about. This coming week, my friends Tommy and Mihee of Enlightened Events will be organzing a the EcoSavvy Festival to be held at Mel Lastman Square. I think this is a great event for anyone of all ages. Learn about green choices you can make, from local companies who implement sustainable practices in their business models. Come out, learn a bit, and start conversations with others to spread the word. There will be lots of unique programming throughout the two days, so make sure you check out the events schedule to plan what you want to see. Below is a press release with further information about the EcoSavvy Festival 2009. Toronto - Being green in North York is about to get easier with the approach of its Second Annual EcoSavvy Festival, to be held on June 19th and 20th at Mel Lastman Square. Presented by Enlightened Events, the EcoSavvy Festival is an exciting, free event for the public, focused on helping individuals to make informed, green choices while promoting local and sustainable businesses and organizations. At the EcoSavvy Festival, attendees will be introduced to green and responsibly made products & services, including: sustainable fashion wear, non-toxic cleaning products, chemical free & organic make-up, safe organic kids products, and delicious local organic food. Along with Live music performances by local Canadian artists, this year’s festival will consist of several fun interactive events for all ages. ‘One event that we’re excited to add to this year’s festival is the Eco-Fashion show.’ says Mr. Tommy Trinh, Co-Founder of Enlightened Events. ‘The Eco Fashion Show will have a serene, organic feel to it; the runway will be lined with a set of beautiful trees, and the show will take place under the natural rays of the sun.’ The fashion show will feature clothing lines carried by Green is Black, a retailer that features sustainable, ethically made clothing, and 69 Vintage, a chic vintage clothing store that lets customers re-imagine old styles into new. Other special events at the EcoSavvy Festival include: a delicious organic food sampling event; DIY natural cleaning products workshops; eco kids activities, including a presentation by Earth Rangers and their animal ambassadors; and a food drive for North York Harvest Food Bank, where organic seeds will given to those who donate non-perishable food items at the festival. Partners of the EcoSavvy Festival include: Bullfrog Power, Zerofootprint, Toronto Vegetarian Association, Anarres Natural Health, Retire Your Ride Program from the Clean Air Foundation, Green Enterprise Toronto, North York Harvest Food Bank, and Tonic Toronto Magazine. Enlightened Events is a social enterprise dedicated to building environmental and social awareness through fun, informative, and interactive events. At our events, such as the EcoSavvy Festival and EcoSUAVE 2009, we focus on helping consumers make informed choices while promoting local and truly sustainable businesses and organizations. We are mindful of the environmental, social, and ﬁnancial impact of all products and services at our events, and work diligently to eliminate “greenwashing”. Microsoft released cumulative updates for both Media Center for Vista (KB967632) and the Media Center TV Pack for Windows Vista (KB966315). Issue in which the seek bar is not displayed correctly on some Media Center extensibility applications. I'm sure some of you have seen or heard about a brutal call that was made by the Hawk-eye system, which I had previously blogged about here as well as other associated posts, during the match between Andy Murray and Ivan Ljubibic. If not, here is a link to the youtube video. Even though the ball was clearly out, it was called in by the Hawk-eye system. The following link is an explanation of what happened from Hawk-eye. Quickly summarized, this was what was shown on the both the video boards and tv. The system showed the second bounce, which happened to be on the line. Instead, this was what really happened. 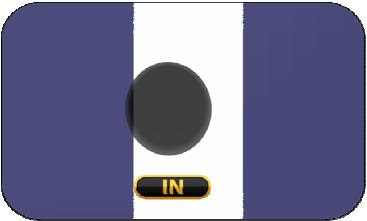 This mistake was partly due to an error by the operator who is responsible for displaying the correct bounce mark, but the system has also been modified as a result of this incident to ensure that the operator always goes to the correct bounce mark, and prevent this happening again. Building upon the success of his previous workaround for ATSC reception in Windows 7/Media Center TV Pack for Vista for those in Canada, former Microsoft MVP Peter Near has come up with a new workaround that allows ATSC reception using any compatible/supported ATSC tv tuner (recall that the last workaround required you to have the HDHomerun ATSC tv tuner). For more information, check out Peter's latest blog entry, ATSC in Canada for Windows 7 (works with all ATSC tuners). Great work Peter, and this does reinforce the fact that it is NOT a technical limitation as to why Microsoft is NOT providing this functionality in either the Windows 7 beta releases or Media Center TV Pack for Vista. Microsoft released Power Pack 2 for Windows Home Server today. Windows Media Center computers will automatically have access to content stored in shared folders on the home server. Music, Photos, Videos, and Recorded TV folders are enabled by default. Windows Media Center Extenders can access and stream multimedia content stored on the home server. Access permission can be granted on an individual folder basis. Windows Home Server now supports streaming MP4 files, a popular format for high quality multimedia, to Xbox 360 and other devices that support the MP4 format. Metadata such as title, artist, composer, album, and genre now appears in the music or video library. Power Pack 2 will be made available via Windows Update. Users need to have Windows Home Server with Power Pack 1 already installed on their home server. Power Pack 2 will automatically install as part of Windows Update if Automatic Updates is enabled on the home server. (How to turn on automatic updates.) The English version release date is March 24th. Chinese, French, German, Japanese and Spanish is currently scheduled to be available before the end of April. For more information, see the following blog posting - Windows Home Server - Announcing Power Pack 2. This posting is to follow up on a blog posting I made last year - OMB, Citizen Involvement and the threat of costs. To recap, an application filed last year by Kimvar, the developers of Big Bay Point Resort, seeking recovery of legal costs from the Innisfil District Association, Nextnine, 2025890 Ontario Ltd., and Gilbert's LLP lawyers, Tim Gilbert and David Donnelly. The OMB had already approved the development. This application was dismissed by the Ontario Municipal Board (OMB). The decision in this matter is intended to reinforce and reiterate the Board's practice that costs are not awarded lightly nor are they awarded routinely. Awards of costs are rare, especially proportionate to the number of cases decided by the Board. Potential parties and the public should not be fearful of participating in Board proceedings, a sentiment that has been expressed in decision after decision. Costs should never be used as a threat or a reason to dissuade public participation. The Board has the statutory jurisdiction to award costs for the purpose of controlling its process. Costs before the Board have never been intended to follow "the cause" nor are they intended in any way to indemnify a successful party. Each application for costs is decided on its own merit, based on an assessment of conduct. Microsoft released cumulative updates for both Media Center for Vista (KB960544) and the Media Center TV Pack for Windows Vista (KB958653). The Ehvid.exe process crashes. This issue is reported by the Dr. Watson application when it occurs. Only the audio part of back-to-back recordings plays on computers that have digital cable card tuners. This issue is occurs after the installation of update 955519. Fixes an issue in which the screen saver starts every 10 minutes when you play music with photo slides how in Windows Media Center Extenders. Fixes an issue in which continuous music playback fails in Windows Media Center Extenders. Fixes a robustness issue in scenarios with in-band data (DVB). Fixes an issue in which in-band schedule data recordings are split into multiple files. Fixes an issue in which the computer may crash after you remove or upgrade tuner hardware. Fixes an issue in which guide data stops downloading. Fixes an issue in which scheduled recordings disappear. Improves the experience of re-enabling device sync for recorded TV. Note: To improve the experience of re-enabling device sync for recorded TV, you should also install the update that is mentioned in Microsoft Knowledge Base article 960774. As one of the Board of Directors for Ontario Nature, I wanted to let everyone know about a fundraising event that Ontario Nature is holding. 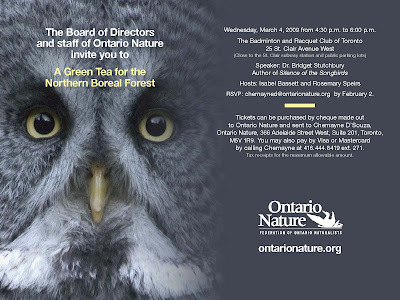 You are invited to a Green Tea on Wednesday, March 4, 2009 on behalf of Ontario Nature’s work to save wildlife habitat in the Northern Boreal Forest. This vast, world-significant Forest is Canada’s last frontier. It encompasses crucial habitat for endangered species and is the nesting ground for millions of north American songbirds. Your $100 ticket is your important individual contribution to help Ontario Nature maximize Premier McGuinty’s pledge of protection for half the Northern Boreal. Help us conserve the vast tracts of forest required by species such as the endangered Woodland Caribou, so future Canadians can enjoy seeing these iconic animals in the wild not just on the reverse of the Canadian 25-cent piece. Help us safeguard the nesting habitats of our warblers and other beautiful songbirds. This is a cause that should resonate with every Toronto-area resident who thrills to spring birdsong as the migration passes through each year. Our keynote speaker is Dr. Bridget Stutchbury, author of Silence of the Songbirds, a passionate expert on songbird decline. She will entrance you with her photos of birds and her astounding radar images of bird migration over the Great Lakes. You’ll see the clouds of birds descend into Toronto’s ravines, parks and backyards to rest before their long flight north to mate and nest. Our Tea sponsors are Isabel Bassett, former Ontario cabinet minister and former chair of TVOntario, and Rosemary Speirs, past-president of Ontario Nature and a former journalist. We assure you that every dollar of your ticket is going to Ontario Nature. Ontario Nature is one of Canada’s most respected conservation organizations, with 142 affiliated clubs across the province. We maintain a Boreal Program office in Thunder Bay and our campaigners work with First Nations and local communities in building support for conservation north of the 51st parallel. Because we are a registered charity, you will get a tax receipt for the maximum allowable amount. Please share this invitation with friends, family, and high-school age children, and bring them with you. We look forward to welcoming you! Please RSVP to Chemayne D'Souza at chemayned@ontarionature.org by February 2, 2009. Tickets can be purchased by cheque made out to Ontario Nature and sent to Chemayne D’Souza, Ontario Nature, 366 Adelaide Street West, Suite 201, Toronto, M5V 1R9. You may also pay by credit card by calling Chemayne at 416.444.8419 ext. 271. As a useful followup on my previous blog post, ATSC in Canada for Windows 7 Media Center and WMC TV Pack, where former Media Center MVP Peter Near details getting ATSC reception to work in Windows 7 Media Center and the TV Pack for Windows Vista, Peter has just posted a complete walkthrough of how to get ATSC reception working in Canada on Windows 7 Media Center and/or TV Pack for Windows Vista (note, this only works with the HDHomerun ATSC product by SiliconDust, and not other ATSC tuners). Thanks for the awesome post, Pete. Here is an event some of you might be interested in, especially for those that are interested in learning more about local food sources that have been produced in a sustainable manner. A couple of friends of mine, Tommy and Mihee, who are fellow Toronto Environmental Volunteers, are organizing an event, EcoSUAVE 2009, through their company, Enlightened Events, in partnership with Local Food Plus. This event, being held at Canada's National Ballet School on the evening of Saturday, February 21, 2009, will give guests the opportunity to sample locally produced delicious wines, beers, and finger foods. To accompany the food and drinks, guests will be treated to Live Jazz music. With the many externalities that exist in food supply chain, education is key to ensure that people know what the true cost of food actually is. Many organizations and even governments such as the City of Toronto now have local food policies in place (e.g. City of Toronto - City Council Minutes Item 25.26 - Local Food Procurement Policy and Implementation Plan). As more people learn about the social, environmental and economic benefits of local food production, we will all make better choices with outcomes that result in a more sustainable form of food production, processing, distribution, and consumption. Below is a press release with further information about EcoSUAVE 2009. Toronto - Enlightened Events is proud to present its upcoming event, EcoSUAVE 2009, to be held at Canada’s National Ballet School on Saturday February 21, 2009. EcoSUAVE 2009 is an green affair where guests can sample delicious, local and sustainable food & drinks whilst enjoying Live Jazz music performed throughout the night. At EcoSUAVE, a term coined by Enlightened Events as being “Effortlessly gracious and green in a social manner”, attendees will have the opportunity to sample delectable hors d'oeuvres and beverages, including organic wines, beers, canapés, chocolate truffles, popcorn, and ice cream, among others. To accompany the food and drinks, guests will be treated to Live Jazz music from the golden era of the jazz standard. Listeners will be exposed to songs from variety of composers, from Gershwin and Cole Porter, to Rogers and Heart. Located at the award winning National Ballet School on 400 Jarvis Street in Toronto, the event will open its doors at 8 PM and end at Midnight. Tickets are $20 at the door, and $18 online. Advanced tickets can be purchased at http://www.enlightenedevents.ca/. EcoSUAVE 2009 is created in partnership with Local Food Plus (LFP) to raise awareness about local and sustainable food production. LFP is an award winning non-profit organization that brings farmers and consumers to the table to share in the benefits of environmentally and socially responsible food production. They are committed to building and fostering local sustainable food systems by certifying farmers and processors and linking them with local purchasers committed to building and fostering local sustainable food systems by certifying farmers and processors and linking them with local purchasers. Enlightened Events is an educational event company dedicated to building environmental and social awareness through fun, informative, and interactive events. At our events, such as the EcoSavvy Festival and EcoSUAVE 2009, we focus on helping consumers make informed choices while promoting local and truly sustainable businesses and organizations. We are mindful of the environmental, social, and financial impact of all products and services at our events, and work diligently to eliminate “greenwashing”. I will be in touch with the winner to arrange prize delivery details. Due to the success of this giveaway, I plan to hold another one in the near future, so stay tuned! It was with much disappointment that Media Center in both Windows 7 and the WMC TV Pack did not support ATSC for those of us in Canada, even with hacks such as this. However, former Microsoft MVP Peter Near described a potential workaround for this issue, as mentioned in his blog entry, ATSC, Canada, and Windows 7 - A Sliver of Hope, and worked with SiliconDust, makers of the HDHomerun ATSC product, to create a viable solution. For more details, see Peter's latest blog entry on this issue, ATSC in Canada on Windows 7 - It's Here!, and this link on SiliconDust's support forum named ATSC OTA in Canada with WMC TV Pack or Win7. Many thanks to both Peter and the folks at SiliconDust, for pushing to come up with a solution for us Canadians. Note, this is not supported by Microsoft, but I'll definitely take what I can get. Once you have seen ATSC, NTSC just simply is not good enough anymore! See this blog entry for details. Tennis Canada announced that the Rexall Centre, home of Rogers Cup Toronto, will be the host site for the upcoming Davis Cup by BNP Paribas Americas Zone Group I tie between Canada and Ecuador. The event will take place from March 6-8, 2009 and will mark the eighth time in Davis Cup history that Canada has played in the provincial capital, but only the third occasion since 1958. Matches will be played on hard courts in the Centre of Excellence, the indoor facility at the world-class stadium and national training centre. The only other Davis Cup tie contested at Rexall Centre was outdoors in 2005 when Canada played host to Belarus, losing a tough World Group tie that was decided in the fifth rubber. The Miele Canadian Davis Cup team members facing Ecuador will be selected by Tennis Canada at a later date. The 2008 team consisted of multiple Canadian Davis Cup record holder, Wimbledon and Masters Cup champion and world No. 1 doubles team member Daniel Nestor (Toronto); Canada’s top male singles player Frank Dancevic (Niagara Falls, Ontario); Davis Cup veteran Frederic Niemeyer (Sherbrooke, Quebec) along with rising star Peter Polansky (Thornhill, Ontario). Historically, Canada has a 1-4 overall record against Ecuador. The two teams last faced each other in April 1998 on outdoor clay courts in Guayaquil, Ecuador. A win for Canada would pit them against Peru on the road in May for a second round tie and a chance to advance to a World Group playoff. Tickets are on sale now to the public. Call the Davis Cup hotline at 416-665-9777 ext. 4755 or 1-877-2TENNIS (1-877-283-6647). The event will also be Web cast live in both official languages on tenniscanada.com. Best wishes to everyone for 2009!